1.1. Competitive territories: stimulating business performance and extroversion through transnational linkages, clusters and networks. 1.2. Innovative territories: unleashing territorial potential to improve the transnational innovation capacity of the business sector. 1.3. Territories of knowledge: entrepreneurial learning and knowledge transfer for more competitive SMEs. 2.1. Biodiversity: taking on the transnational challenge by promoting ecological connectivity and transnational ecosystems' integration. 2.2. Sustainable territories: fostering transnational cooperation for resource efficiency and climate change resilience. 2.3. Delivery on environmental legal framework: improving transnational governance capacities. Together with socioeconomic development and demography, environment, and natural and cultural heritage, climate change is recognised as one of the main challenges shared by the programme actors. Climate change adaptation is therefore relevant for the entire programme. It is specifically covered within the objective 2.2. There are two EU macro-regional strategies partially overlapping with the Balkan-Mediterranean geographical scope: the EU Strategy for the Danube Region (EUSDR) including Bulgaria and the EU Strategy for the Adriatic and Ionian Region (EUSAIR) including Albania and Greece. At the wider scale of the entire Mediterranean Sea, cooperation on environmental protection (including climate change adaptation) at transnational level is formalised in the frame of the Barcelona Convention and related protocols. This is relevant for some of the BalkanMed countries (i.e. Albania, Greece and Cyprus). 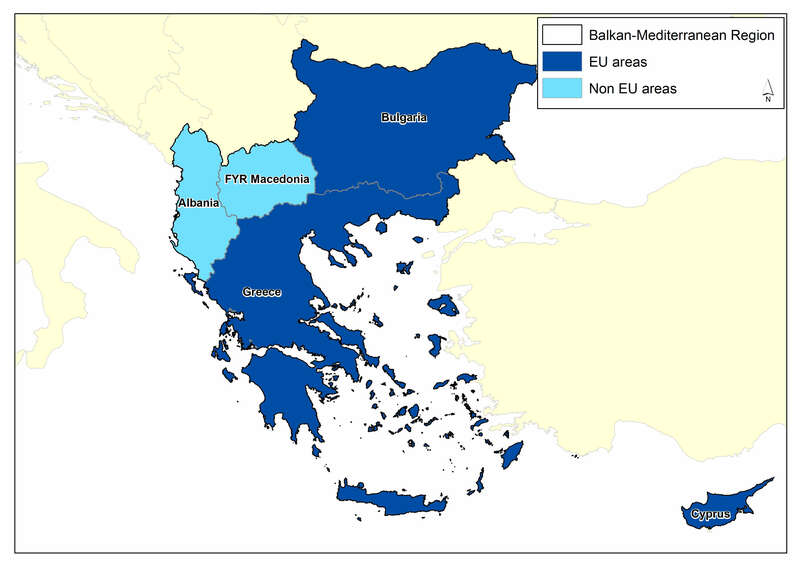 Initiatives described for other regions and relevant for the Balkan Mediterranean countries include the Environment and Climate Regional Accession Network (ECRAN; 2013-2016) involving also FYROM and Albania (see the Adriatic-Ionian region for more details). No adaptation strategies and plans have been developed for the moment in the specific context of the Balkan Mediterranean region. The ‘Regional Climate Change Adaptation Framework for the Mediterranean Marine and Coastal Areas’ endorsed by the 19th meeting of Contracting Parties (COP19) of the Barcelona Convention is relevant for some countries of the region (Albania, Greece and Cyprus). Examples of projects funded by the BalkanMed Programme 2014-2020 are reported below. BeRTISS (BalkanMed real time severe weather service) (2017-2019) involves partners from three countries (Greece, Cyprus and Bulgaria) and aims to develop a pilot transnational severe weather service to enhance the safety, the quality of life and environmental protection in the Balkan‐Mediterranean region. The service is expected to provide timely information and warning regarding severe weather events (in particular heavy precipitation events) as well as long-term monitoring of weather and climate change in the region. Early warning is also the focus of the DISARM (Drought and fIre ObServatory and eArly waRning systeM) project (2017-2019), which involves partners from the same countries contributing to BeRTISS. The two projects are complementary, as DISARM focuses on different climate-related impacts (drought and wildland fires) and aims to deliver an integrated observatory platform and an early warning system to support their prediction and promote their prevention. DISARM will not only contribute to the prediction of drought and wildland fire risk in the Balkan-Mediterranean area, but will also assess related risks under a changing climate. Wildfires events are acknowledged as one of the most relevant risk in the region and their early detection is also the focus of the SFEDA (Forest Monitoring System for Early Fire Detection and Assessment in the Balkan-Med area) project (2017-2019). Partners representative of all the four coastal Balkan-Mediterranean countries contribute to the HERMES (A Harmonised fRamework to Mitigate coastal EroSion promoting ICZM protocol implementation) project (2017-2019). In this region, the impact of winter storms, the effect of sediment blockage due to river damming, the degradation of beach stability in areas of urban and tourist activities and the lack of integrated approach in human interventions along the coast have led to significant coastal erosion rates. HERMES aims to develop a common framework for coastal erosion mitigation and beach restoration through the implementation of a coherent ensemble of studies, the sharing of already developed technical tools and the design of joint policy instruments. The framework will be tested in four sites including evaluation of historic and future coastal dynamics, definition of erosion and climate change vulnerability indicators, evaluation of human related pressures, organisation of collected data in a Web-GIS, application of a modelling toolkit, and evaluation of a series of intervention scenarios to cope with current and future coastal erosion.